This classic bulb-forcing vase holds a hyacinth bulb. Photo by Barb Gorges. It’s the season for buying spring-blooming bulbs. But not all of them need to go in the garden—at least not right away. Some of them can be kept back for forcing. Bulb forcing allows you to enjoy crocus, the small iris, hyacinth, daffodils and even tulips indoors earlier than they bloom outside. Think of them as a deep winter gift to yourself, or for someone else. Cheyenne Botanic Gardens director Shane Smith recently gave me background on the practice and a few tips. Buy spring-blooming bulbs now. Bulbs ordered from catalogs begin shipping here around the beginning of October because bulbs normally need to be planted outdoors when the soil cools, but before it freezes in December. For bulb forcing, figure 12 weeks minimum of “cool treatment,” however tulips need 13 weeks or more. Once the minimum is met, you can stagger when you start warming up the bulbs. You can aim for specific bloom times during our cabin fever months, January through March, or maybe even later into spring when we get those depressingly late, tulip-breaking snow storms. Smith said he used to tell people to buy the premium-sized bulbs for forcing, but now he thinks he gets more bloom for his buck with the smaller grades of bulbs. Premium hyacinth bulbs go for more than a dollar apiece in the John Scheepers catalog, but you might find smaller bargain bulbs and have more, if only medium-sized blooms, for the same amount. Smith said some varieties of bulbs are easier to force and bulb catalogs often will mention which ones. Varieties seem to go in and out of vogue so don’t be surprised if Smith’s are hard to find. Hyacinth is the classic forcing bulb, growing 10-12 inches tall. Each stalk is covered in tiny florets. Smith looks for Pink Pearl, Queen of the Pinks, White Pearl, L’Innocence (white), Blue Jacket, Delft Blue and Blue Giant. Crocus-sized bulb-forcing vases are harder to find. Photo by Barb Gorges. All varieties of crocus force well. Smith’s favorite varieties are Remembrance (purple), Blue Ribbon, Giant Yellow and Jeanne d’Arc (white). Only 4-5 inches tall, they are usually planted as a mass. Iris reticulata, though related to the summer-blooming bearded iris, grows only 4-6 inches high. Recommended for rock gardens, mine bloomed outside at the end of last February, but it would be nice not to have to brave winter winds to enjoy it. Smith said all the varieties force well. Scheepers lists eight ranging in color from white to blue to deep purple, all marked with a bit of yellow. 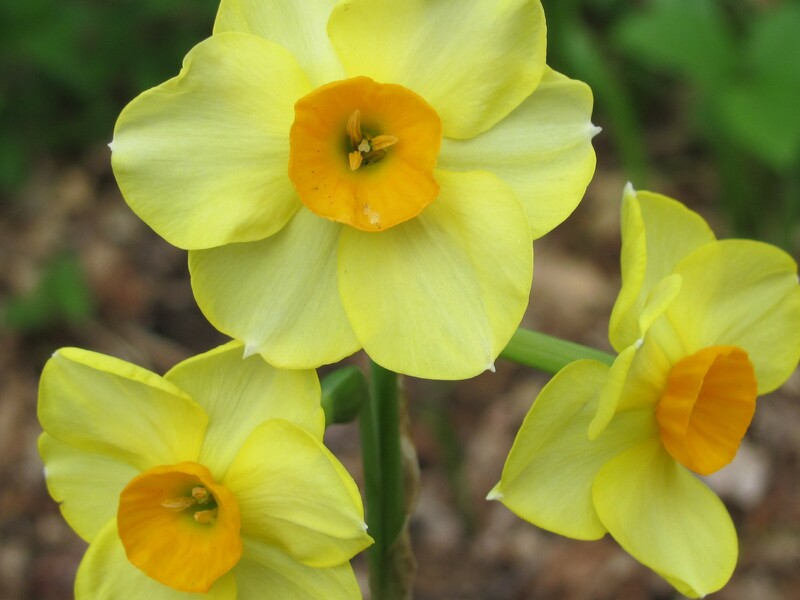 Almost any daffodil (narcissus) will work well for forcing, said Smith. The popular Paperwhite narcissus, however, is a tropical bulb, so it doesn’t need cooling. Tulips, said Smith, are the hardest to force. They need the longest cooling time, minimum 13 weeks. They also may get floppy and need staking. Look for the earliest varieties, those that would otherwise bloom outdoors here (winter-hardiness zone 5) in April. There are a variety of other, more difficult spring-blooming bulbs to experiment with: snowdrops, grape hyacinth (muscari) and squill (scilla). Bulb-forcing vases are not easy to find this fall. Your best bet is Amazon or eBay. These vases, usually glass, are pinched near the top, providing a cup for the bulb to sit suspended so that only its base touches the water. You watch as the roots grow to fill the rest of the vase and the flower stem sprouts. For this forcing method, you can cool just the bulbs in your refrigerator for the recommended time. Be sure hyacinth bulbs don’t touch produce. If you are lucky enough to find a bulb forcing vase, remember to change the water regularly. These hyacinth bulbs have been potted up and will be set in a 2-foot deep trench in the vegetable garden and mulched with straw or pine needles for their 12-week “cool treatment.” Small bulbs, like crocus, need a half inch of soil covering them. Photo by Barb Gorges. Smith pots his bulbs. Without a cellar between 35 and 45 degrees, he instead buries the pots in a 2-foot-deep trench in his vegetable garden. He then backfills the trench with straw or pine needles. The mulch allows moisture to percolate down, whether the bulbs are watered by hand or by snow, and allows in air. Pots can be plastic or clay. However, if you have a fancy one, you may want to use it as a cache pot in which you insert the utilitarian pot that was buried. Put only one type of bulb in a pot because different types sprout at different rates. The depth of the pot should allow 2 inches or more of potting soil under the bulb with the bulb tip just a little below the rim of the pot. Smith said regular packaged potting soil will do. Potting soil can be very dry, so mix it with water in an old dishpan or bucket before spooning it into the pot as the layer that will be under the bulbs. Then set the bulbs on top, right side up. The root end can have bits of root left and the shoot end is usually pointier. You can pack the bulbs in, nearly shoulder to shoulder, leaving just a little space between them. Then fill in with more potting soil. Smith said the top third of the bulb can be left exposed, but crocus and iris bulbs need to be covered a half inch deep. Label the pot so you remember what’s in it—especially if you do more than one kind. Mark where you bury the pot. And mark your calendar for when to bring the pot in. While the potted bulbs are chilling in the dark, make sure the soil doesn’t dry out. You may need to lift the mulch and water once a month if it’s a dry winter. When you bring a pot in, Smith recommends putting it in a dim room at 60 degrees or cooler until the shoots are a few inches tall. Then move it to a bright window and 65 degrees. “Buried to blooming” may take two weeks. Turn pots every day to keep plants growing straight. Flowers can last a week or two. Once in bloom, you can prolong it by setting the pot farther from the window and keeping the room’s temperature at 65 degrees. The advantage to planting forced bulbs in potting soil is that you can give them a second life. Cut back the spent flowers and keep watering until the leaves turn yellow. Plant the bulbs out in the garden when the soil thaws, where they might bloom again in two years. The bulbs for the vases were left in the refrigerator for a couple of months to cool and taken out in early January. Also in early January I brought in the pot of hyacinth and the pot of crocus that were buried in the vegetable garden and covered with a foot of leaf mulch. The bulbs in vases didn’t do well. They couldn’t seem to grow enough roots. That hyacinth stalk of flowers was about 15 percent the size of the ones in the pot. I felt sorry for the crocus bulbs in the tiny vases and soon planted them in dirt where they were much happier. That proves you could cool your bulbs in the fridge and then plant them in soil, without wintering them in the garden. But the pot of crocus that did spend two months buried did very well. 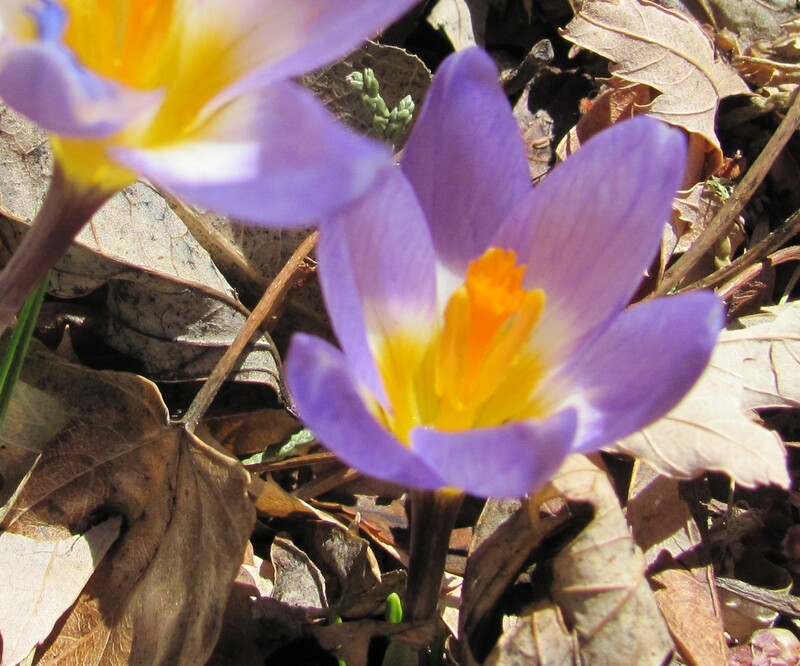 Interestingly, the yellow crocus bloomed before any of the shades of purple. I would force bulbs again. If I plant the hyacinth bulbs individually, they would be easier to share with friends, or I could stagger the dates I bring them indoors, prolonging the season of sweet-smelling flowers. Iris reticulata bulbs were forced to bloom indoors one spring, then replanted outside in the garden in early summer where they bloomed the next spring. Photo by Barb Gorges. Categories: Bulb forcing, Container gardening, Flowers, Gardening, Iris, Spring bulbs, Uncategorized | Tags: Bulb forcing, Cheyenne Botanic Gardens, crocus, daffodil, garden, gardening, hyacinth, iris reticulata, Scheepers, Shane Smith, spring bulbs, tulip, vase | Permalink. Remember your first sighting of blooming flowers last March? Maybe it was crocuses pushing through snow. Or later, you spied your first daffodil, and then there was a flurry of tulips. No matter how many more snowstorms we had, bulbs were the colorful optimists. Did you say to yourself, “I want some in my yard”? If so, August is the time to make your plans for spring-blooming bulbs. The catalogs have been coming in the mail since July, though the bulbs will be mailed at the appropriate time for planting, usually mid-October, before the ground freezes. I’ve been succumbing to those full-color catalogs and store displays for more than 30 years, and I have learned a few things, but I also checked in with Laramie County master gardener Kathy Shreve and learned more. Kathy is in charge of the Laramie County Master Gardeners’ bulb sale. After struggling with Cheyenne’s gardening challenges, it’s a relief to know that we are actually well-suited to growing spring bulbs, many originating in Iran, Iraq and Mongolia, which have a similarly dry climate, Kathy said. Just about all the spring bloomers, with the exception of jonquils—more suited to warmer climates—do well here. Before you fill your shopping basket, think about where you want bulbs. I never seem to do this and end up freezing while digging out more lawn to accommodate my new collection. All of the bulbs do well in sunny locations, including those areas that won’t be shaded until the trees leaf out late spring. Shady areas might do best with daffodils, snowdrops and squill, Kathy said. If space is limited, consider planting different sized bulbs on top of each other. Since the big tulips and daffodils need to be planted the deepest, place them at the bottom of an appropriate-sized hole. I usually dig one hole wide enough for a group of a dozen or more bulbs properly spaced—I prefer clumps to lines. Fill in with dirt until you reach the right depth for the next biggest bulb, perhaps a smaller tulip or hyacinth, and top off with a layer of the smallest bulbs: grape hyacinth, crocus, snow crocus, snow drops, squill (Scilla). You also want to plant long-lived bulbs, that keep returning every season, where they can be left for many years. The Siberian squill I planted more than 20 years ago continues to spread and come up thicker every spring. Kathy mentioned that small bulbs like these can be naturalized in your lawn, as long as you don’t get the urge to mow before they are finished. You also need to think about what you want to grow over the bulbs in the garden for the rest of the growing season. A shallow-rooted or self-seeding annual works well because you won’t have to disturb the soil. It can cover the dying tulip and daffodil leaves before they can be removed, which is when they are completely yellow and finished feeding the bulbs. The bulbs are dormant the rest of the year, but they do need some water. So pair them with summer flowers that also like it somewhat dry because bulbs will rot if it is too wet. The bulbs that keep coming back are the “species” tulips, the ones closest to wild–which bulb breeders have messed with the least. These are the Kaufmanniana and Greigii types. The Darwin Hybrids are also good. These are also less expensive because they are older varieties. Kathy said in Cheyenne they don’t require extensive soil preparation before planting. My species tulips are plain red, but I planted a sack of a dozen bulbs a few years ago and this spring I had a mass of 40 blooms. Some of them were a little small and Kathy suggested I dig them all up and replant the smallest bulbs somewhere else while they mature. Keep in mind: The bigger the bulb you buy, the bigger the flower. The same variety of tulip or daffodil can be sold in different sizes. The purveyors with the best reputations will tell you how big their bulbs are so you can compare. Getting a great blend of flower colors is not my forte. I tend to go for the polychromatic look—any color I can get to grow. Sometimes clashing shades of red bloom next to each other at the same time. Kathy, on the other hand, works with color palettes. For the Master Gardeners’ sale this year, her selections are in the yellow to apricot family, with purple/blue accents provided by an allium and a hyacinth. All bulb descriptions include an expected bloom time. What actual week any bulb begins blooming varies from year to year based on how quickly the soil begins warming, so it is all relative, but there is a progression, though a warm microclimate, like next to a south-facing brick wall, will speed it up. 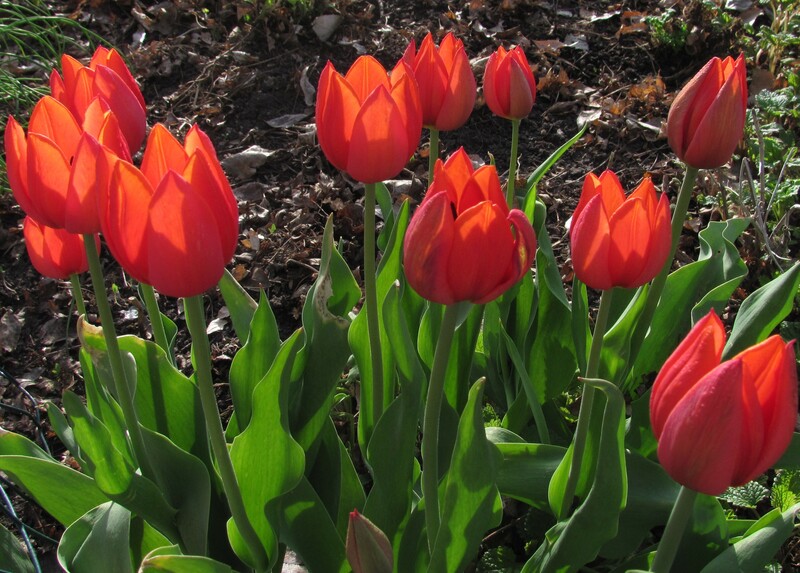 First the small bulbs bloom: crocus, squill, snowdrops; then the medium-sized, hyacinth, and the species tulips, like Kaufmanniana and Greigii; finally the big tulips, like the Darwin Hybrids. Daffodils (also referred to as “Narcissus”) also come in a range of bloom times. You can have bulbs blooming from March through early June in Cheyenne. Reputable bulb companies will make suggestions and even put together collections—as Kathy has for the sale. Just check that all the bulbs are suitable for our hardiness zone 5. I aim for colder zones though, 3 or 4. “Don’t pick them if you want them to come back,” Kathy said. This was the most surprising new information I learned. I like to bring in a few tulips to enjoy close up. Apply fertilizer designed specifically for bulbs once in the spring as their leaves emerge and once in the fall. Kathy uses half the recommended rate. If you have problems with critters digging up and eating your bulbs, try daffodils and allium, Kathy said. Animals don’t find them as edible. And finally, the bulb companies have lots of advice. One even sent me a booklet with my order that I found helpful. You can also “Ask a Master Gardener” at the Saturday Farmers Market, now through Sept. 14. Bulbs are available at local garden centers in the fall. Two catalogs I have ordered from are Breck’s and van Bourgondien; however, www.JohnScheepers.com, the company the Master Gardeners are ordering from, identifies all of its offerings by name (not just “large red tulip”) and is indexed. It is also developing extensive online bulb horticultural information. Call 1-860-567-0838 to request a print catalog. More information about the Master Gardeners’ bulb sale being held now through Sept. 14 at the Saturday Farmers Market at the Cheyenne Depot Plaza is at www.LCMG.org. Bulb orders can also be made through the Laramie County Cooperative Extension office, 310 W. 19th St., Suite 100, 633-4383. Categories: Spring bulbs | Tags: allium, crocus, daffodils, hyacinth, John Scheepers, Kathy Shreve, Laramie County Master Gardeners, narcissus, snowdrops, spring bulbs, squill, tulips | Permalink.